Veggie Venture Lesson: Try new foods more than once, even if you don't like them so much the first time. 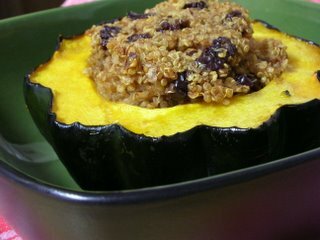 Here's why: Acorn squash is one of my favorite foods, reliably delicious. But tonight, it turned out bland and watery. Was it a problem with the recipe? No. Then why? I don't know though it's possible that it was old, given that squash is harvested in fall not spring. But if I'd never had squash before, based only on tonight, I'd never try it again. I don't often cook foods 'out of season'. But today felt more like winter than spring AND my good-cook, good-cousin recommended the recipe, so I did. And I'm glad! For even though the squash itself wasn't so great tonight, it re-introduced me to quinoa, a favorite from my vegetarian days. Note 4/25: The quinoa is also great on its own, heated and served in individual ramekins. 2006: With subsequent attempts, I liked this recipe so much that the recipe is featured (along with a funny story about quinoa) in a 2006 Kitchen Parade column. Quinoa: Cook quinoa according to directions, including 1 teaspoon salt if not specified. Mix cherries, walnuts and cinnamon in small bowl. Combine with cooked quinoa. Assembly: Wash squash well, cut in half cross-ways and remove seeds. Cut tips cross-ways so squash will sit flat. Rub flesh with olive oil. Place in baking dish (with cover) lined with foil. Stuff squash with quinoa, tuck anything leftover between the squash. Bake: Cover and bake at 350F for 40 minutes. Remove cover, bake another 5 - 10 minutes to brown filling. If time/inclination allow, chop cherries in half so there's "more" to spread throughout the quinoa. My cousin also uses dried cranberries, I think dried apricot would be great, too. For calorie-reduction, next time I'll halve the quantity of cherries, nuts and maple syrup .